1Chemical Engineering Department, Technological Institute of Durango (ITD), Durango, Mexico; 2National Polytechnic Institute Interdisciplinary Research Center for Regional Integral Development at Durango (IPN-CIIDIR-DGO), Durango, Mexico. Copyright © 2013 María Adriana Martínez-Prado et al. This is an open access article distributed under the Creative Commons Attribution License, which permits unrestricted use, distribution, and reproduction in any medium, provided the original work is properly cited. In accordance of the Creative Commons Attribution License all Copyrights © 2013 are reserved for SCIRP and the owner of the intellectual property María Adriana Martínez-Prado et al. All Copyright © 2013 are guarded by law and by SCIRP as a guardian. Arsenic and fluoride are elements known to cause human health problems and it has been documented that both elements are found in high concentrations in the Guadiana Valley aquifer, in the state of Durango, Mexico. Since underground water is the source for potable water bottling companies commercialized in Durango City; such high concentrations reduced the quality of bottled water for human consumption according to NOM-041-SSA1-1993. Legislation establishes a maximum permissible limit (MPL) of 0.7 mg/L for fluoride and 0.025 mg/L for arsenic. In this research the main objective was to evaluate the quality of bottled water expended in Durango City with respect to the well from which water is extracted. Findings showed that the highest fluoride concentration was 5.86 mg/L (8.4 times MPL), with 100% of sampled brands exceeding the MPL (range: 1.09 to 5.86 mg/L). On the other hand, for arsenic, the highest concentration was 0.076 mg/L (threefold), with 38% exceeding the MPL (range: 0.001 to 0.076 ppm). Statistical analysis showed significant differences only for fluoride, according to Fisher LSD (Least Significant Difference) test, with an F value of 14.5 at a p value of 0.0005. According to the comparison between the quantified concentrations in bottled water and groundwater, it was found that groundwater was subjected to treatment; however, although a significant decrease in fluoride and arsenic concentration was observed, the removal processes used were not efficient to meet set standards. Durango state is located in Northwest Mexico (Coordinates: 24˚56'05"N 104˚54'43"W) and it stands at an altitude of 1880 m. Durango City, with a population of 582,267 (2010), is the capital of Durango State and is located in the Guadiana Valley, in the southern central area of the state. Durango City is supplied with potable water from exploitation of Guadiana Valley aquifer through 1097 wells with an extraction volume of 148.31 × 106 m3/year; National Water Commission in Durango reports that 100% of water demand is covered with groundwater [1,2]. The Guadiana Valley aquifer is currently classified as overexploited and fluoride and arsenic are present at much higher concentrations than the maximum permissible limits (MPL) established in NOM-127-SSA1-1994 ; however, their presence is mainly attributed to the strata geological composition [4-7]. Potable water bottling companies that are commercialized in the city extract water from groundwater wells, treat it before bottling, and must meet standards established by NOM-041-SSA1-1993 . Maximum permissible limits (MPL) set by Mexican law varies depending on its use; NOM-127-SSA1-1994  applies for groundwater (0.025 and 1.5 mg/L, for arsenic and fluoride, respectively), whereas NOM-041- SSA1-1993  applies for bottled water (0.025 and 0.7 mg/L, for arsenic and fluoride, respectively). On the other hand, the World Health Organization (WHO) established 0.01 mg/L (or parts per million, ppm) for arsenic and 0.7 mg/L for fluoride in water for human use and consumption, based on the fact that both of them could pose health damage. Research has been conducted about health problems caused by arsenic and fluoride; such as bones, skin and teeth damage from high fluoride exposure and cancer in some cases for arsenic [4,6,9-20]. The objective of this research was to evaluate the quality of bottled drinking water with respect to groundwater wells of Durango City, based on arsenic and fluoride concentration. All water bottling companies of Durango City were inventoried, listed assigning sequential numbers instead of brand names (confidential status), categorized by sectors (North, South, West, and East), and located in a map using AutoCAD®. Samples of all companies were collected twice with a time difference of six weeks. Sampling and preservation were performed according to the Standard Methods of Analysis; flasks were washed and rinsed with distilled water, for fluoride analysis; and for arsenic, flasks were washed with a 20% by volume nitric acid and hydrochloric acid solution plus the addition of concentrated nitric acid to reduce pH < 2.0 for preservation [6,8,21]. Arsenic analysis was quantified with graphite furnace atomic absorption spectroscopy (GFAAS) established by standard methods ; whereas fluoride was determined using SPADNS spectrophotometric method . The differences between wells and companies, with respect to fluoride and arsenic content, and sectors (North, West, South, and East) were validated with a two-factor ANOVA (wells and companies); and with the LSD (Least Significant Differnce) Fisher test [6,7], to establish if the wells and companies had different contents or the same, all at an α = 0.05 using the Statistica software version 7® . Thirty water bottling companies established in Durango City were inventoried; however, 6 run out of business, then only twenty-four were sampled twice: North (4), South (5), East (7), and West (8) . Calibration curves were developed for arsenic and fluoride. Concentration values were averaged with data gathered of the two samplings, by company and by sector. Results were evaluated comparing them to the maximum permissible limits (MPL) in drinking water according to the Mexican regulation (0.7 and 0.025 ppm, for fluoride and arsenic, respectively). The consumption of purified bottled water is a very common practice nowadays everywhere. In Durango City, many consumers buy bottled potable water because quality of water provided by municipal services is not trusted. In most cases companies offer containers of 20 liters (refillable) and only a minority offers bottles of less than or equal to 1 liter (nonrefillable). Figure 1. Average concentration of fluoride in water bottling companies by sector. Red line represents the MPL. Table 1. Fluoride and arsenic concentration in water bottling companies and well from which water is extracted. tions by sector and Table 1 resumes concentrations for all water bottling companies and groundwater city wells. 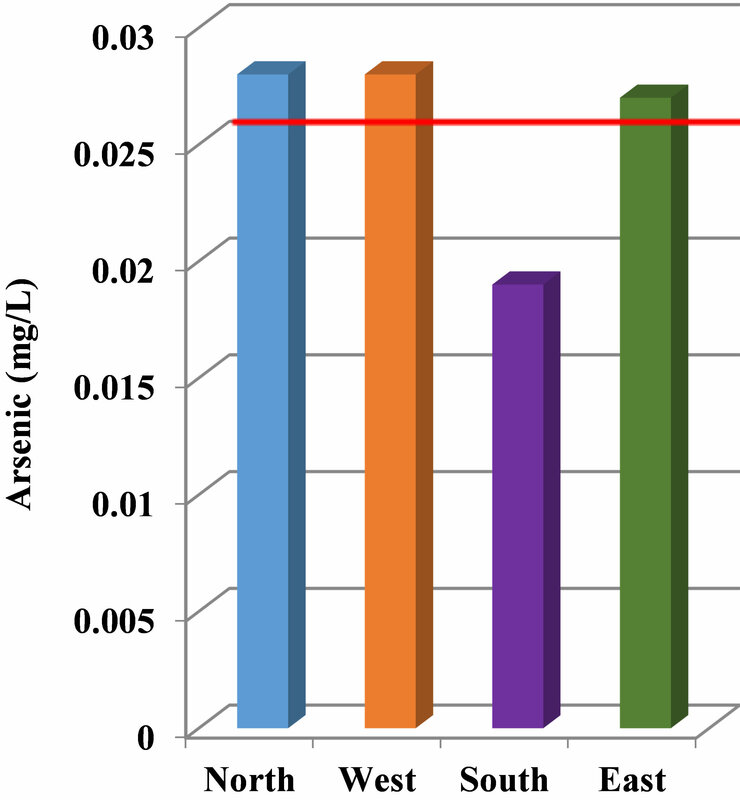 For arsenic, the concentration ranged from detection limit (0.001) to 0.076 ppm; the overall average concentration was 0.0256 and the highest value found in bottled water in the city was 0.076 ppm (eastern sector) 3 times the MPL. The resulting average concentrations by sector were slightly (6% to 13%) above the MPL (0.025 mg/L) for North, West and East sector and below MPL for South sector, and only 38% of the companies exceeded the MPL, see Table 1 and Figure 2 for results. As already mentioned, for arsenic, concentration in bottled drinking water was much lower than groundwater well; efficiency ranged from 14% to 97% by the reduction in its concentration and from 4% to 65% with respect to the MPL (0.025 ppm), concentrations in 5 companies were higher than groundwater well. If WHO standard (0.01 ppm) were considered, then 59% of the companies would not meet the MPL. In order to support information, random samples were sent for analysis to a certified laboratory and results were comparable to the ones obtained in this research. Surfer® software was used to elaborate isoconcentration maps with lines of equal concentration. It helps visualize the behavior of the concentration of fluoride and arsenic, of wells from which water is extracted by bottling companies. 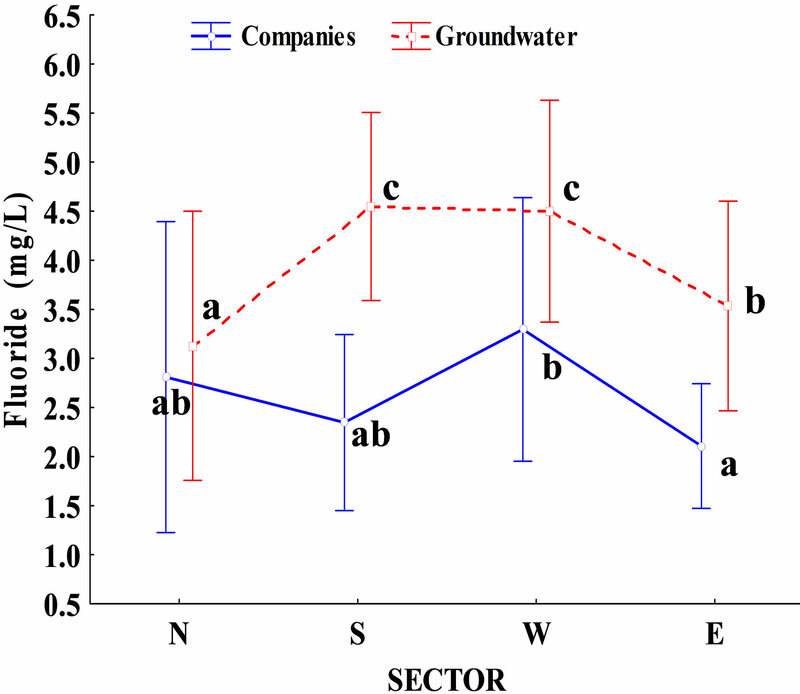 Figure 3 shows an isoconcentration map for fluoride in groundwater wells and location of companies. No isoconcentración map for arsenic is included because there were no significant differences between sectors, water bottling companies, and groundwater wells. Figure 2. Average concentration of arsenic in water bottling companies by sector. Red line represents the MPL. Data of fluoride and arsenic concentrations gathered in this research was subjected to a statistical evaluation [6, 7] and was compared to concentration in Durango City groundwater wells, from which water is extracted prior to treatment and bottling process [4,7]. Figure 3. Fluoride isoconcentration (mg/L) map for groundwater wells in Durango City, Mexico. Figure 4. Fisher LSD test. Statistical analysis for fluoride concentration in water bottling companies versus groundwater wells, in Durango City, Mexico, from which water is extracted prior to treatment. Same letters meaning no differences between groups (α = 0.05). 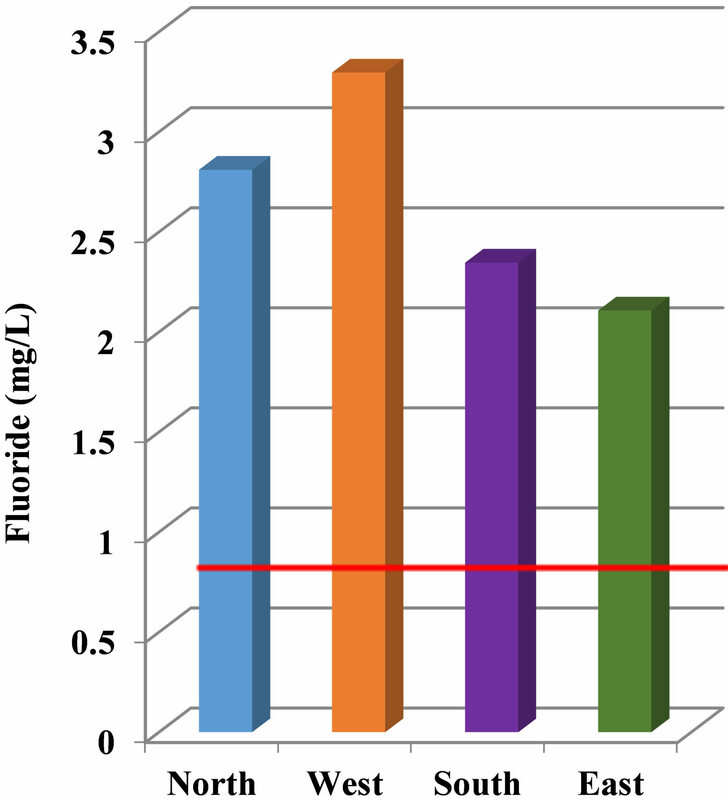 results for the statistical analysis for fluoride; which refers to the significant differences for fluoride concentration by sector (N, S, W and E) and source (C and GW) according to Fisher LSD (Least Significant Difference) test. Fisher’s LSD is one of the existing methods for comparing treatment group means after the ANOVA null hypothesis of equal means has been rejected using the ANOVA F-test. Same letters equals to no differences between groups (α = 0.05). Results gathered in this research revealed deficiency in treatment, low removal efficiency and bad quality of potable bottled water, with respect to fluoride and arsenic content. Water source for water bottling companies established in Durango City comes from underground of Guadiana Valley aquifer. This aquifer is classified as overexploited and with high content of fluoride and arsenic due to its strata geological composition. All companies that commercialized bottled water in Durango City were tested to quantify fluoride and arsenic concentrations and compared to those concentrations present in groundwater wells. For fluoride, 100% of the bottled water companies presented lower fluoride concentration compared to the groundwater wells. Comparing one of the cases, the well with the highest content had 5.46 ppm, whereas the concentration of bottled water extracted from the same well was 1.66 ppm. Efficiency ranged from 20% to 70% (decrease in concentration) and 75% to 87% with respect to the MPL (0.7 ppm); only one company presented a higher concentration than the source, however, none of them met the MPL established (0.7 ppm). For arsenic, 68% of the companies had a lower arsenic concentration compared to the underground water. In this case, the well with the highest arsenic concentration had 0.072 ppm and the concentration found in the samples of the water bottling company, extracted from the same well, was 0.034 ppm. When determining efficiency, based on reduction in its concentration, range was from 14% to 97% and with respect to the MPL (0.025 ppm) ranged from 4% to 65%. Fifteen companies (62.5%) met MPL; nine (37.5%) did not meet MPL, where seven of them (26%) presented a higher concentration than the source. It is very clear that not all removal treatments used by water bottling companies were effective. In the case of fluoride, even though concentrations decreased substantially, none of the companies met the MPL. For arsenic removal treatments, 62.5% of the removal treatments used achieved the MPL. Statistical analysis showed significant differences only for fluoride, according to Fisher LSD test, with an F value of 14.5 at a p value of 0.0005. It is important to point out that the regulatory Agency of Water Resources, in Durango City, has made several attempts to solve this problem, to promote decrease concentration of fluoride and arsenic. Resources were allocated to the acquisition of small treatment plants for the removal of these compounds and were assigned to high concentration areas, without success due to lack of training in the handling of equipment and appropriately following the former proposal. A high percentage of the wells did not comply with standards representing latent health risk for adverse effects conferred by fluoride and arsenic. Action must be taken because chronic or acute health problems will manifest in the short or medium term, which represents high spending in the health sector. This research was funded by the municipal government, Water Municipal Agency (AMD, Spanish acronym) Technological Institute of Durango (ITD, Spanish acronym), and National Polytechnic Institute—Interdisciplinary Research Center for the Local Integral Research, at Durango (IPN-CIIDIR-DGO, Spanish acronym). Masters Scholarship awarded by the National Council of Science and Technology (CONACyT, Spanish Acronym). I. Flores-Montenegro, “Evaluation of Fluoride and Arsenic Concentration in Guadiana Valley Drinking Water and Removal Alternatives,” M.Sc. Thesis, Technological Institute of Durango, Durango, 1998. “Evaluación de las Concentraciones de Flúor y Arsénico en el Agua Potable del Valle del Guadiana y Alternativas de Remoción,” Tesis de Maestría, Instituto Tecnológico de Durango, México,1998. C. C. González-Nevarez, “Concentration Change of Arsenic and Fluoride in the Guadiana Valley Aquifer and Its Relationship to Static Level,” M.Sc. Thesis, Technological Institute of Durango, Durango, 2007. “Cambio de la Concentración de Arsénico y Flúor, en el Acuífero Valle del Guadiana, y su Relación con el Nivel Estático,” Tesis de Maestría, Instituto Tecnológico de Durango, México, 2007. M. A. Martínez-Prado, M. E. Pérez-López, I. VillanuevaFierro and C. C. González-Nevarez, “Behavior of Arsenic and Fluoride Concentration in Guadiana Valley Aquifer of Durango, Mexico,” Journal of Environmental Protection Vol. 4, No. 12, 2013. Special Issue on Groundwater Pollution, in Press. A. Albores, M. E. Cebrian, I. Tellez and B. Valdez, “Comparative Study of Chronic Hydroarsenicism in Two Rural Communities in the Region Lagunera of Mexico,” Boletín de la Oficina Sanitaria Panamericana, Vol. 86, No. 3, 1979, pp. 196-205. A. H. Smith, E. O. Lingas and M. Rahman, “Contamination of Drinking Water by Arsenic in Bangladesh: A Public Health Emergency,” Bulletin of the World Health Organization, Vol. 78, No. 9, 2000, pp. 1093-1103. M. T. Alarcón-Herrera, A. Martín Domínguez and I. R. Martín Domínguez, “Fluoride Concentration in Drinking Water: Its Relationship to Dental Fluorosis,” Proceedings of the 28th Inter-American Conference of Sanitary and Environmental Engineering, Cancun, 27-31 October 2002, pp. 1-5. “Concentración de Flúor en el Agua Potable: Su Relación con la Fluorosis Dental,” Memorias del XXVIII Congreso Interamericano de Ingeniería Sanitaria y Ambiental, Cancún, México, 27-31 Octubre 2002, pp. 1-5. L. E. Landin-Rodriguez, “Physicochemical Parameters and Concentration of Fluoride and Arsenic in Water from Wells in the City of San Luis Potosi and Conurbated Area. Alternative Treatment: Fluoride and Arsenic Adsorption on Al2O3 Activated Interphase/Aqueous Solution,” M.Sc. Thesis, San Luis Potosi University, San Luis Potosi, 2006. “Parámetros Fisicoquímicos y Concentración de Flúor y Arsénico en el agua de los Pozos de la ciudad de San Luis Potosí y Zona Conurbada. Alternativa de Tratamiento: Adsorción de Flúor y Arsénico en la Interfase Al2O3 Activada/Solución Acuosa,” Tesis de Maestría, Universidad de San Luis Potosí, San Luis Potosí, 2006. M. Bocanegra-Salazar, “Health Risk Assessment for Exposure to Fluoride and Arsenic in Well Water for Consumption in High, Media, and Center Plateau Areas in the State of San Luis Potosi,” M.Sc. Thesis, San Luis Potosi University, San Luis Potosi, 2006. “Evaluación de Riesgo en Salud por la Exposición a Fluoruro y Arsénico en Agua de Pozo para Consumo de las Zonas Altiplano, Centro y Media del Estado de San Luis Potosí,” Tesis de Maestría, Universidad de San Luis Potosí, San Luis Potosí, 2006. APHA, “Standard Methods for the Examination of Water and Wastewater,” 21st Edition, American Public Health Association, Washington DC, EUA, 2005. Statistica, “Data Analysis Software System,” Version 7®, StatSoft, Inc., Tulsa, 2004.